Titanium and titanium matrix composite reinforced with 10 vol. %(TiB+TiC) (10TMC) were oxidized at 700, 800 and 900 oC for 30, 50 and 70 h, and their oxidation behavior was studied. Oxidation of Ti and 10TMC in air led to the formation of rutile-TiO2 without any other oxides. The oxide scale thickened with an increase in the oxidation time and temperature. 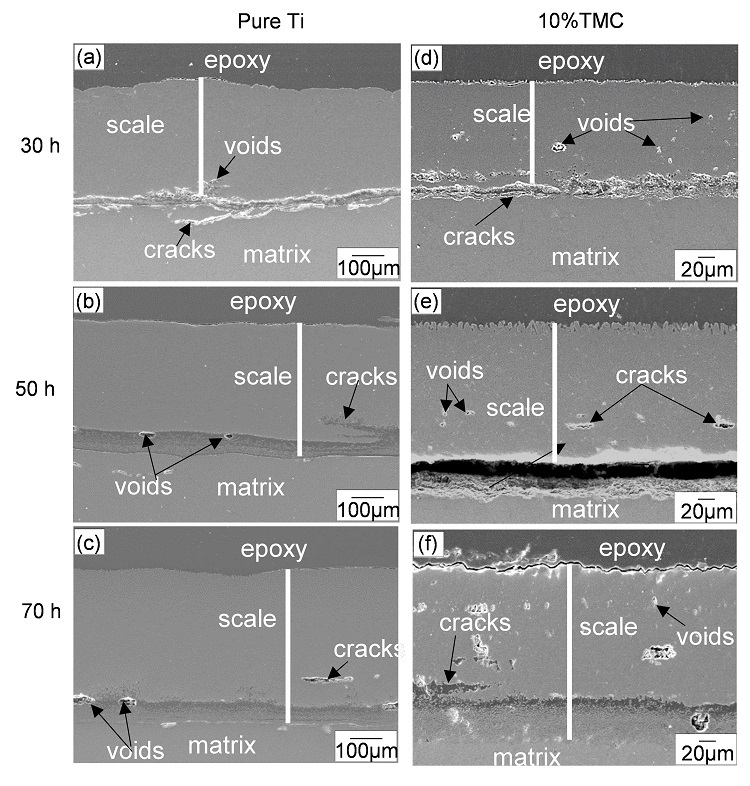 Significant growth of the rutile oxide caused thermal stresses which generated during oxidation and voids formed at the scale/matrix interface, and the oxide scales were susceptible to cracking. M. Yamada, “An overview on the development of titanium alloys for non-aerospace application in Japan,” Material Science and Engineering A, vol. 213, pp. 8-15, 1996. M. Peters, J. Hemptenmacher, J. Kumpfert, and C. Leyens, Titanium and Titanium Alloys: fundamentals and applications, Germany: WILEY-VCH, pp. 1-36, 2003. S. R. Seagle, “The state of the USA titanium industry in 1995,” Material Science and Engineering A, vol. 213, pp. 1-7, 1996. S. Abkowitz, P. F. Weihrauch, S. M. Abkowitz, and H. L. Heussi, “The commercial application of low-cost titanium composites,” Journal of Metals, vol. 47, pp. 40-41, 1995. S. Ranganath, “A review on particulate-reinforced titanium matrix composites,” Journal of Materials Science, vol. 32, pp. 1-16, 1997. F. H. Froes, “Recent advances in titanium metal matrix composites,” USA, TMS, Warrendale, PA, 1995. T. Yamamoto, A. Otsuki, and K. Ishihara, “Synthesis of near net shape high density TiB/Ti composite,” Material Science Engineering A, vol. 239, pp. 239-240, 1997. D. B. Lee, Y. C. Lee, and D. J. Kim, “The oxidation of TiB2 ceramics containing Cr and Fe,” Oxidation of Metals, vol. 56, pp. 177-189, 2001. B. J. Choi and Y. J. Kim, “Effect of B4C size on tensile property of (TiB+TiC) particulate rein-forced titanium matrix composites by investment casting,” Materials Transactions, vol. 52, pp. 1926-1930, 2011. P. Yadav and D. Lee, “Oxidation of Titanium and Ti/(TiB+TiC) Composite”, AITI, vol. 2, no. 4, pp. 130-132, May 2017.